My head is a bit over 62cm in circumference but most climbing helmets on the market only go up to a circumference of 61cm. 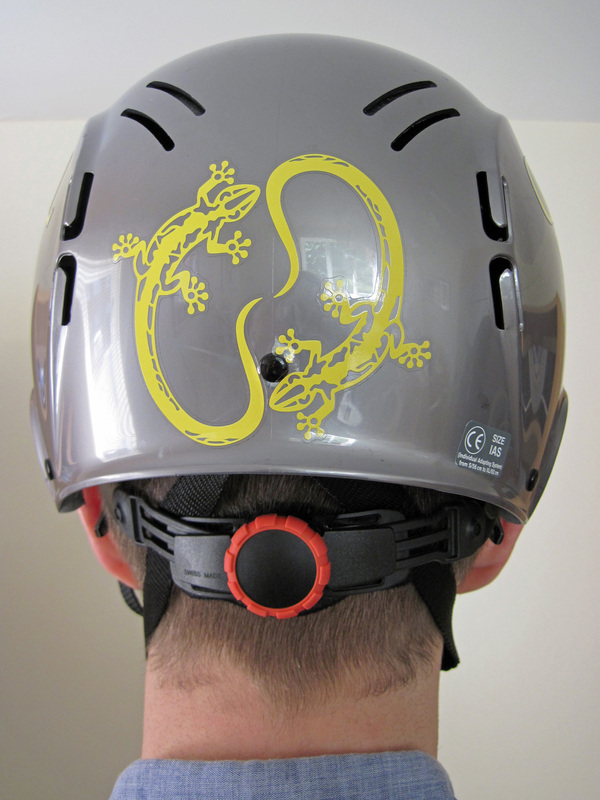 I don’t think I’m the only climber whose head is bigger than 61cm in circumference and so I have written the following helmet guide for climbers with generous heads. 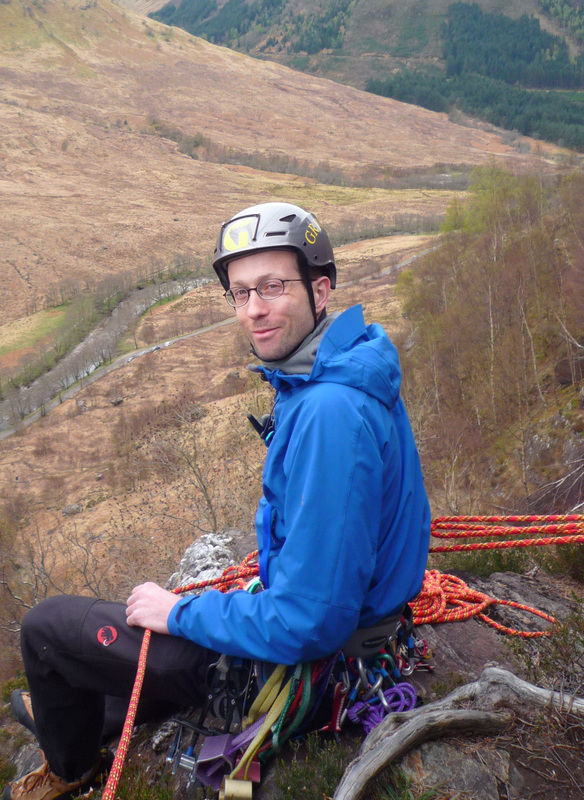 The British Mountaineering Council (BMC) has published an excellent guide to helmets https://www.thebmc.co.uk/new-helmet-guide-launched and it’s well worth a read if you want to understand what types of helmet are suited to different activities and how to care for your helmet. There are also good guides to buying a helmet from Outdoor Gear Lab and Switchback Travel. I have summarised below some key points from these guides. As the BMC guide says, the “best helmet is a good fit, is comfortable, and is affordable.” This obviously means that you need to try a helmet on to see if it fits and not buy it if it moves around or is uncomfortable. If you plan to use your helmet outside the summer months, then make sure it’s big enough to allow you to wear a hat or a hood underneath it. 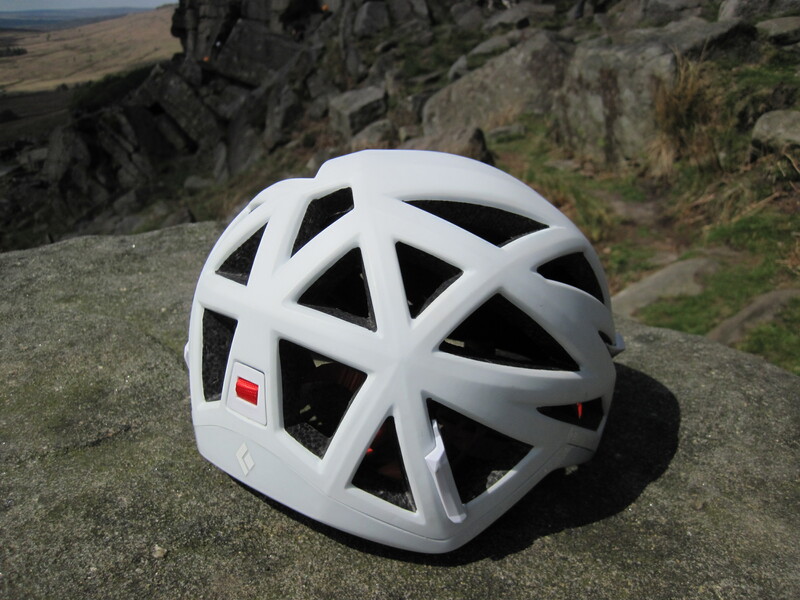 A helmet must also be suitable for whatever climbing or mountaineering activities that you will be wearing it for. There are three types of helmet and the different characteristics of these three can go a long way to determining if they are what you need. These helmets have a hard, tough plastic shell with a flexible, internal cradle of fabric webbing. 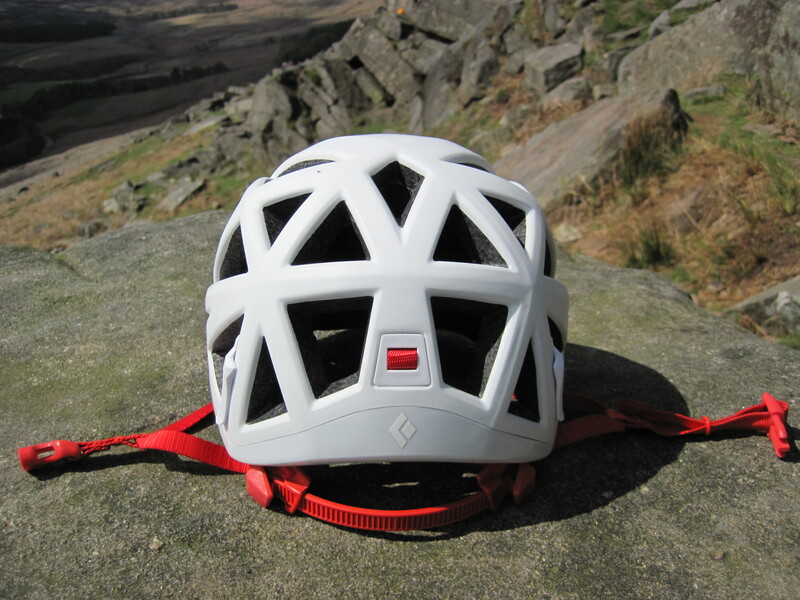 The best example of a hardshell helmet that could fit anyone was Petzl’s Ecrin Roc. Unfortunately, the Ecrin Roc hasn’t been made for a few years and in general there seem to be fewer hardshell helmets on the market nowadays. Hardshell helmet are good at withstanding top impacts (e.g. falling rocks) and are durable. The disadvantages with a hardshell helmet is that they offer little protection for impacts around the rim and tend to weigh more. The traditional material for foam helmets is expanded polystyrene (EPS) covered by a thin polycarbonate shell. This shell helps to distribute the energy of impacts and protects the EPS. The EPS itself is hard, energy-absorbing plastic foam that fractures and crushes when it takes an impact. This means that EPS helmets have a tendency to crack and dent if treated roughly. In the last few years, helmets have come on to the market that use expanded polypropylene (EPP) instead of EPS. EPP is also an energy-absorbing, plastic foam. However, whereas EPS permanently compresses when it absorbs an impact, EPP is meant to absorb the energy of an impact better and rebound from the impact. This should make EPP helmets more durable than those made from EPS. 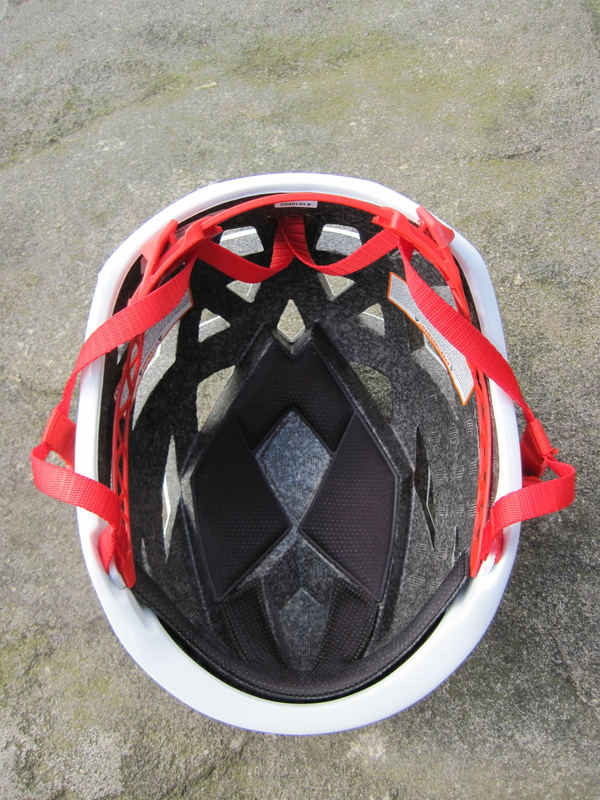 The principle advantage of both EPP and EPS helmets is that they are low weight. The main disadvantage is that they are not very durable. 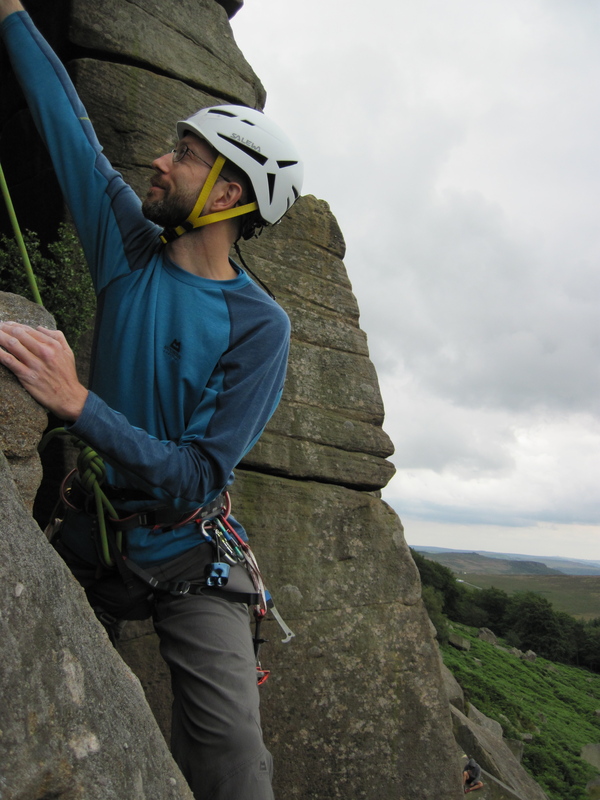 Me climbing at Stanage in the Black Diamond Vapor Helmet. Hybrid helmets are basically a halfway house between hardshell and foam helmets. They have a rigid plastic shell that is thicker than the shell on purely foam helmets and comes with a foam inner. They give all-round performance that draws on the advantages of hardshell and foam helmets. In particular, hybrid helmet are more durable than foam helmets. However, hybrid helmets give the greatest protection where the foam is present and on some models the foam doesn’t extend to the rim of the helmet. The Vapor is a foam helmet that comes in two sizes, with the medium/large size fitting heads in the range of 58 to 63cm (23-25 inches). It sits low on the head and provides good 360-degree coverage. The Vapor is stunningly lightweight at only 199g (7oz) in the medium/large size, but is quite heavy in price at £120. The construction of the Vapor is interesting and unusual. It has (according to Black Diamond) “a sheet of Kevlar and a series of carbon rods in between co-molded EPS foam” with a thin polycarbonate shell over the top. The idea behind the Kevlar (a material famous for its use in body armour) and the carbon rods is to provide strength without weight. These reinforcements mean that the EPS foam can be thinner and this helps make the Vapor lightweight and give it a much lower profile than other foam helmets. Black Diamond has also saved weight on the Vapor by cutting back on features. In particular, the harness that secures the helmet to your head lacks a lot of the means to make adjustments that you find on other helmets. The two straps that come down on either side of the helmet to form a V shape below your ears are sewn into the chinstrap rather than being attached by an adjustable buckle. This means that the length of the chinstrap can be adjusted, but there is no means of adjusting the position of the straps on your head. I don’t find this an issue, but it’s possible that someone else might find the straps rub against their ears or their front of their neck. The back of the Black Diamond Vapor. The chinstrap has a simple buckle to adjust its length and the tail from this buckle is secured with a thin elastic band. The adjuster at the back of the helmet that is used to tighten it around the circumference of your head is a light and thin ratchet adjuster. This has two moulded push buttons and is easier to operate with two hands. Despite this harness being quite minimal, it provides a secure fit and is easy to adjust. In addition, the whole harness can be pushed up into the helmet. This neat little feature means that the helmet takes up slightly less space, and there is less of risk of damaging the harness, when the helmet is being transported. The Black Diamond Vapor with the harness pushed up inside the helmet. Another thing that makes the Vapor comfortable to wear is the soft padding at key points at the top and front of the inside of the helmet. Unfortunately, this padding soaks up sweat and can’t be removed for cleaning. It’s therefore a good thing then that the Vapor is brilliantly ventilated, with a staggering 21 vents running around the sides and rear and the foam cut with channels to allow airflow. This makes the Vapor is a great helmet for hot weather, but not necessarily a helmet I’d use on a cold and windy day (particularly as it is only just possible for me to wear a thin hat under it). The inside of the Black Diamond Vapor. Although I suspect that the risk of a small rock falling through one of the ventilation holes and into your head must be fairly small, the risk is still there. It’s this risk that probably explains why Black Diamond describe the Vapor as a cragging helmet. In addition, it’s so full of holes and feels so light that whenever I’m using the Vapor it always feels like I’m handling an egg. The Vapor just doesn’t feel robust compared to the helmets I’ve used in the past and so I treat it with extra care when packing it or taking it to the crag. A slightly odd feature of the Vapor is that the headtorch clips come separately and you have to attach them yourself by pushing them into the foam. The idea seems to be that you can leave them off if you aren’t going to be wearing a headtorch. However, it might also be that it is easier for Black Diamond to leave the clips off when the Vapor is being made. The Vega is a foam helmet that’s available in two sizes, with the large / extra large size fitting heads between 59 to 63 cm (23-25 inches). It sits a bit higher on the head than the Black Diamond Vapor, but still provides good all round coverage. The Vega has a fairly thin plastic shell over a foam inner. Unusually, it uses two types of foam. Surrounding the whole inner of the helmet is a dense layer of EPS foam. The forehead and the top of the head are given extra protection with a single, honeycomb piece of EPP foam. The difference between the Vega and the Vapor is that the Vega manages to be low weight (285g, 10oz) while still feeling fairly robust. The Vega also manages to provide good ventilation while not notably reducing protection through a series of long, thin vents around the front, sides and back. The level of protection, low weight and set up of the vents make the Vega a good all-rounder. There are neat design touches too, such the neat combination of clips at the front and elastic at the back to attach a headtorch. The back of the Salewa Vega. There are plenty of ways to adjust the fit of the Vega. 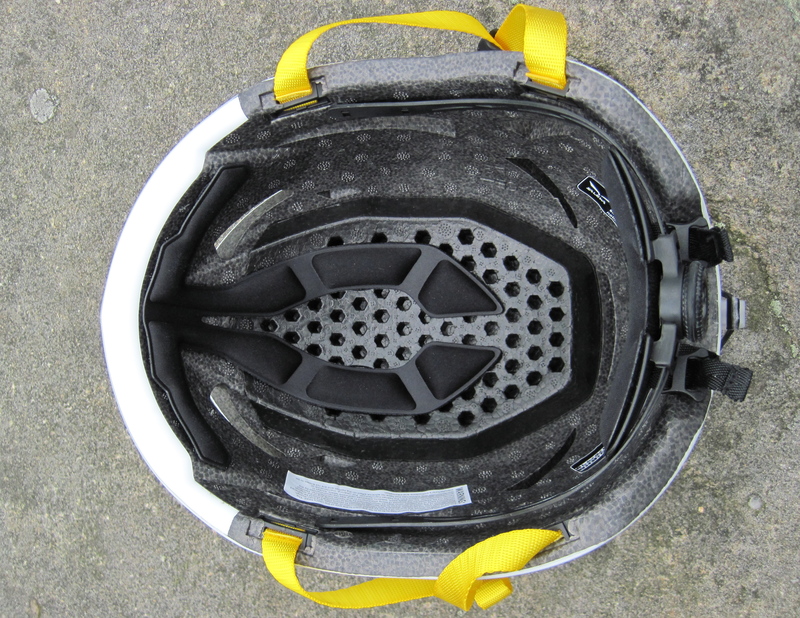 There’s an adjustment wheel at the back that allows you to tighten or loosen the helmet one handed and with gloves on. The position of this wheel / rear section of the harness can be adjusted up or down via a couple of straps with buckles. The position and length of the straps of the harness and the chinstrap can also be adjusted using buckles. The buckles at the V of the straps can be locked in place while there is simple buckle on the chinstrap. Like the Vapor, an elastic band holds excess chinstrap in place. The advantage of this set-up is that the position and length of the straps can be locked in place when you have got them just right. The disadvantage is that it can be fiddly and time consuming to get the position and length of the straps as you want them. This is a bit annoying when you need to adjust the fit because, for example, you want to put a hat on under the helmet. The Vega is a generally well-designed helmet, but there are a couple of things that let it down. The V of straps come close to both the front and back of my ears. The only way to avoid the straps rubbing against my ears is to have the locking buckles on my jaw and this is a bit uncomfortable. The limited padding on the inside of the Vega adds to the discomfort. This padding is in a sort of U shape across the top of the helmet and my head rubs directly against the foam because it is in the centre of this U and so not cushioned. This is uncomfortable without the cushioning provided by hair (which I don’t have), a hat or a hood. The one good feature of the padding is that it is attached by Velcro and so can be removed for cleaning. Unfortunately, when I opened the box, the padding was stuck in a weird location in the helmet because the Velcro had been sloppily placed. Thankfully, I was able to remove the little Velcro stickers and then stick them in the right locations so that the padding could be correctly positioned. The standard size Grivel Salamander has been a very popular helmet and widely available in Europe. The Salamander XL is really just a bigger version of it that Grivel has marketed as meant for those who need to wear a lot of hats (because they are going somewhere very cold) or have big heads. As the maximum size of the Salamander XL is 66cm, it’s almost over catering for this market. Grivel has now moved on to the Salamander 2.0 and I’ve heard that they no longer make the Salamander XL. This is a great shame and means that you probably should grab a Salamander XL if you find one (although you might need to be very lucky it has always been hard to find anyone selling the Salamander XL). 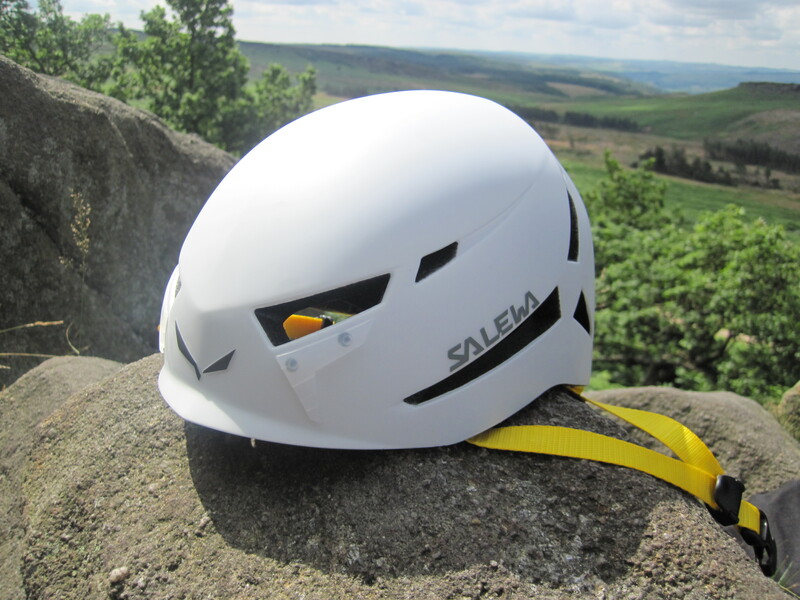 The Salamander XL is a hybrid helmet with an outer shell of ABS and an inner layer of EPS. Most of this foam protects the top of the head and there is a thin band of foam around the rim. The Salamander XL is quite high at the front. This works well if you are wearing ski goggles while mountaineering, but I’ve always been a bit concerned about what would happen if I face planted into a rock face while wearing this helmet. The flipside is that the sides and back of the Salamander XL come down quite far and so provide more protection in those areas. The Salamander XL uses a very similar adjustment system to the Vega, with an adjustment wheel at the back and locking buckles on the harness. This means it has the same advantage / issue as the Vega in that it takes a fair bit of playing around to get the fit right and this fit is then locked in place. There is padding around the front and top of the inside of the helmet and I find it comfortable to wear. Unfortunately, the ventilation is pretty minimal, with four mesh covered vents on the front and a few narrow, long vents at the back. This makes the Salamander XL better suited to colder weather. 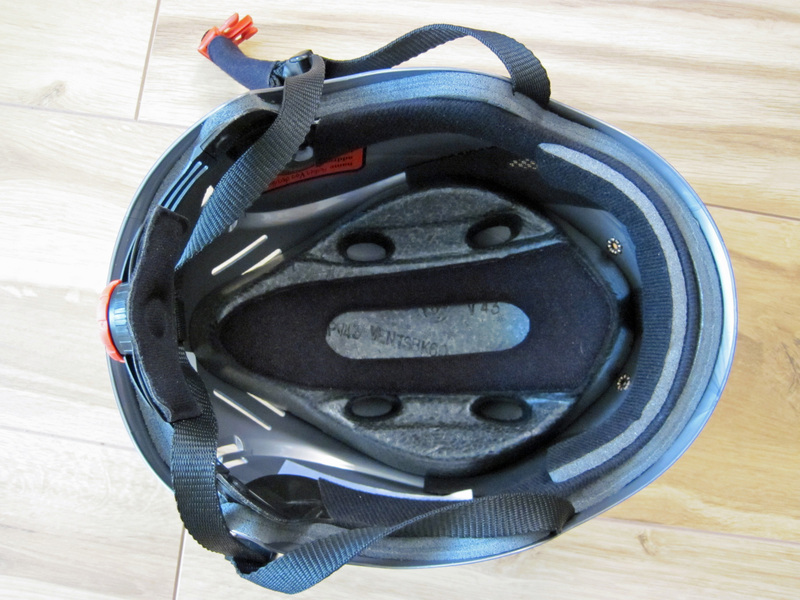 At 320g (11oz), it’s the heaviest helmet in the three helmets being reviewed. There are small metal clips at the front and some elastic at the back to hold a headtorch. The Vector is a cousin of the Vapor and superficially looks quite similar. However, it’s constructed more like a traditional foam helmet, has fewer vents and more adjustment in the harness. It weighs more than the Vapor and doesn’t have the same low profile. The Vector also sits notably higher on the head than the Vapor and this means that it just doesn’t fit me. It’s so high on my head that I lose a fair bit of side protection and look a bit silly. However, someone with a different shaped head may find it a really good option. The Vayu is the more sophisticated cousin of the Vega. If the Vega were a nice, solidly performing family saloon, the Vayu would be a sleek, hi-tech sports car. The Vayu is a hybrid helmet with an outer shell of polymer-ceramic composite material that Salewa call Carbon Nano Tech (which is meant to be hard and light) over an EPP inner. The harness does away with adjustment wheel or ratchets for the radical (but probably lighter) option of an elastic strap. I’m a bit sceptical about using an elastic strap as the main way of holding a helmet in place, but I have to admit that it did provide a comfortable and secure fit when I tried the Vayu on in a shop. It’s such a light and sophisticated helmet, that I would have liked to try it out for this review, but there’s only so many helmets I can realistically own and it’s a bit more expensive than the Vega (it’s about £95-120 depending on where you buy it). The Focus is an EPS foam helmet with a size range of 56-63cm (22-25 inches). It’s lightweight (at 230g or 8oz), has a magnetic buckle on the chinstrap and a “quik-clik” dial for volume adjustment. The Fusion is a hybrid helmet that Wild Country describes as combining “a strong polypropylene outer with an EPS layer, attached by simple mechanical joints. This new system provides greater flexibility between layers, making the model less susceptible to damage.” It’s available in two sizes, with the size range of the large being 56-63cm (22-25 inches). It has a “quik-clik” dial for volume adjustment and is described by Wild Country as a great all-rounder. The Zenith is a foam helmet that apparently fits heads up to 64cm (25 inches). There’s a good review of it done by the Gear Institute. The Vapor is the most comfortable helmet I’ve ever worn. It’s got a great fit, it’s amazingly lightweight and it’s very well ventilated. This makes it a brilliant cragging helmet and good for climbs with a low risk of rock fall (it was perfect for some “sport” via ferrata I did on some baking hot days in Austria). However, you have to pay a lot for that performance and you may not want to pay that much if you want a more robust helmet or one that you can use across a wider range of different types of climbing. The Vega is a good choice if you are looking for that single, all-rounder helmet. It’s well designed and manages to provide good balance of protection, ventilation and weight. At £65-85 (depending on where you are buying it), it’s also a very good price for what you get. What lets it down is that it may not be the most comfortable helmet for some people (although you may find that it works for you if you have more hair than me). You will be lucky to find a Grivel Salamander XL, but if you do it’s worth getting it, as this is a tough and reliable helmet. This is also a great helmet for winter (mainly because there is so much space for extra hats and it’s not as well ventilated as other helmets). 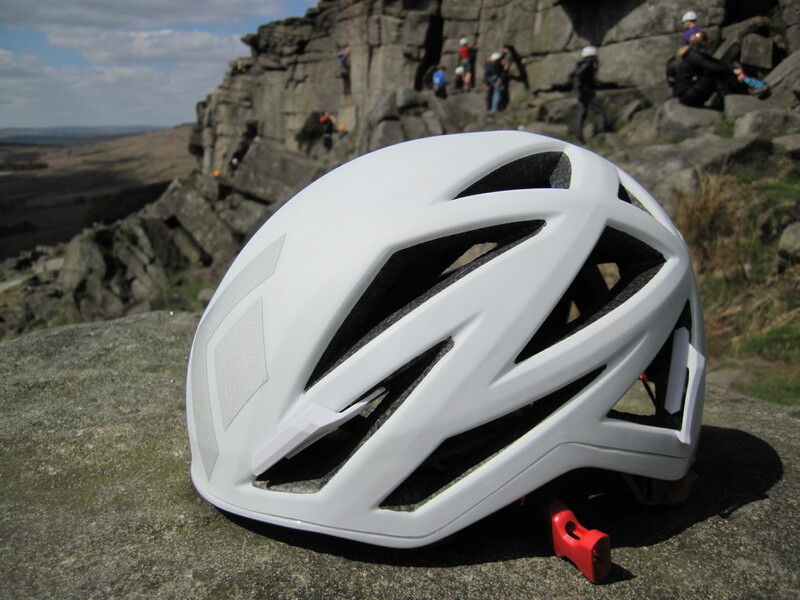 With the Vayu, Vector, Zenith, Fusion and Focus also on the market, this means that there are a few helmet options for climbers with big heads. 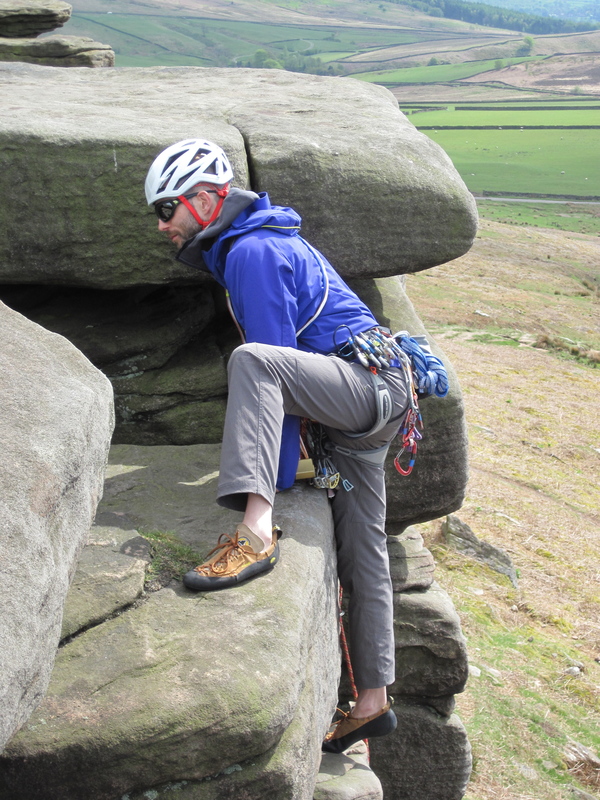 Unfortunately, the range is nowhere near what is available to other climbers so I’d be really interested to hear from any other climbers with ample heads if they find helmets not noted here that fit them or they have experience with the Vayu, Vector, Zenith, Fusion or Focus. This is an updated version of a post I originally published a couple of years ago. With all those big holes I worry about pointy rock falls! I will do my best to avoid rock falls and where a less hole-full helmet if it will be hard to do so. Ouch. It’s just too easy to do it. It feels that the climbing helmets I had used have probably had more active use protecting me from bumping my head on overhangs than from falls. I am a typical round head Asian, and although my head only measures 56cm, I have to wear large to extra large helmet. If I wear Medium usually It’s so tight on side like a torture chamber…worse with ski helmets. Are any of them you tried that you particularly felt more room on the sides and tighter on the back ? Thanks! It’s a good question and I’m afraid that it’s not something I’ve looked into in the past. 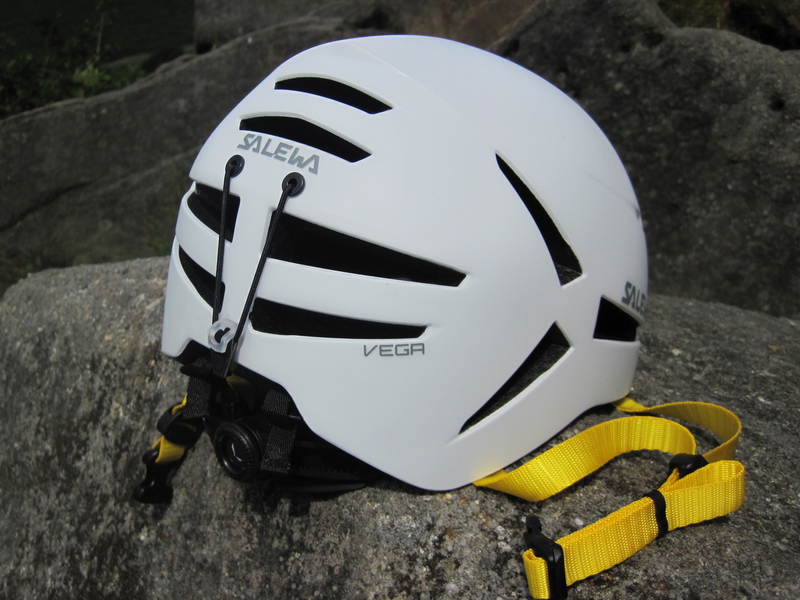 Of the helmets I’ve worn recently, the Salewa Vega seems to have a more round shape (so with more space at the sides) than the Black Diamond Vapor. However, the difference doesn’t seem to be huge. Sorry that I can’t be of more help. Please let me know if you do find a helmet that works for you, as I’d be interested to know. Thanks for this nice review.In the past I had bought grivel salamender xl by your advice and happy with it.Now I want to buy one helmet too ,but cant find grivel xl version.So I want to ask you ,how is Trango Zenith ,did you try that one ? It seems it’s the biggest size in market now. Thanks. I’m pleased that you like the post and that the Salamander worked out for you. I’m afraid that I’ve not tried the Zenith. If you do buy one, I’d be interested to hear what you think about it. I will try to find used salamander from ebay ,If I cant find ,I will try a different option ,maybe zenith idk yet.I will write to you ,If I buy zenith.Thanks have nice day !